In the last installment of this series we went over the definition of aging and the history of its study. Today, we will go into depth about what actually happens with age (observable effects) and why it happens (underlying molecular causes). The study of Geriatrics is the medical discipline revolving around taking care of older patients with significant aging damage, generally known as the elderly. The study of Gerontology is the study of the aging process itself. It includes characterizing changes that occur as a result of aging as well as the study of why, on a molecular level, they occur (generally referred to as Biogerontology). Biogerontology is largely what we discussed the history of in part 1. Gerontology is at the heart of life extension-ism, whereas if the damage of aging is prematurely prevented or effectively reversed geriatrics would invariably go the way of the dinosaurs. In this first section of this article, we will look at the phenotypes, or effects, of aging across the human body. In the second section, we will learn the beautiful (if ugly) truth which inspires modern biogerontology: the same few processes inside and around cells cause all of the various effects across your body, from atherosclerosis to wrinkles. We’ll even take a crack at what those processes are, as scientists of the last few decades have for the first time truly begun to shine light on them. Some tend to have a more powerful effect on health than the others, particularly the cardiovascular, pulmonary, immune and nervous systems. The WHO statistics of the the top ten causes of death in developed countries lists cardiovascular complications as the top two killers, with pulmonary cancers and complications coming in at number three and five, and lung infections (likely deadly due to immune deficiency) as number four. Also on the list is Alzheimer’s, several digestive system cancers, and diabetes. An important point, to make, however, is that organ systems do not act independently and thus all contribute towards whatever pathology people eventually succumb to. People don’t tend to die of endocrine failures, but altered hormonal signalling weakens all systems substantially and can promote cancer. Digestive issues prevent proper nutrient uptake and toxin clearance, leading to tissue damage across the board. Immunodeficiency is strongly associated with cancer, and renal issues can both be deadly on their own and contribute to multiple system failures due to waste accumulation and improper control of electrolytes. Muscles and bones help us exercise and stay healthy, and the aging of the skin increases risk of infection. Becomes pretty much the most cancer prone organ in white people. Thus caring for your skin is not just a sign of keeping your Baywatch dreams alive (speaking of, wear sunscreen!). And, balding is important too. No more dressing up as a night elf at cosplay festivals. As most of us know, our bones get weaker with age. One may wonder, “how do bones get weaker with age? People find bones that are hundreds of years old all the time!”. The answer is simple: while we are alive, our bones are a dynamic organ. They require their own blood supply, and are constantly being remodeled by cells called osteoblasts and osteoclasts. Osteoblasts lay the minerals and increase bone density, and osteoclasts eat it back up while reducing the density. As we age, our osteoblasts start to fail and our osteoclasts pick up steam. The result is a disbalance in the equilibrium, where there is a net loss of minerals. The extreme of this is osteoporosis. The lymphatic system is primarily an immune system, being necessary for the maturation of lymphocytes and effective adaptive immunity. Failure of the adaptive immune system results in increased risk for disease, and increased mortality from diseases like pneumonia. Basically, as your aging immune system fails you become closer and closer to bubble boy (but without a bubble). In addition, cancer’s increased occurrence with aging can be tied in part to failure of immune surveillance^. Immunosenescence is a serious condition and among the most critical aspects of aging to address. The thymus, our organ which trains T-cells (our knights against viruses and cancer), dies young and quickly of its own accord. It shrinks to a negligible size in the third decade of life, a process known as thymic involution. Our T-cell troops are still there but the army becomes outdated in its tactics without the thymus, a process driven by the lack of naive T cells which can adapt to new invaders. A larger and larger percentage of the pool becomes dedicated to fighting latent infections like CMV over time. Lymph nodes, needed for the maturation of both B cells and T cells, also may degenerate. 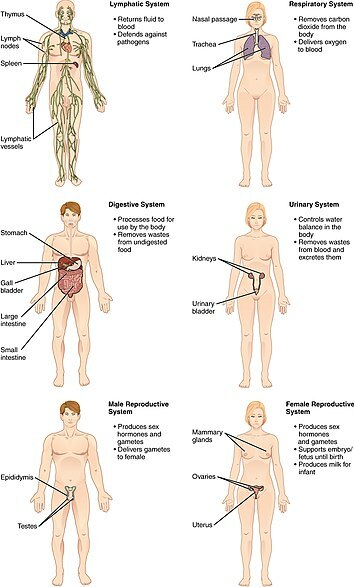 Lymph channels, which have a role in clearing waste around the body, become less effective. In addition, the bone marrow, which produces all lymphocytes as well as leukocytes and red blood cells, ages significantly. The stem cells present in the marrow may become senescent or die, and a smaller and smaller number of clones are involved in creating all your blood cells. They increasingly receive signalling from the wrong niche, producing more leukocytes and less lymphocytes^. And they frequently cause cancers such as leukemia and lymphoma. 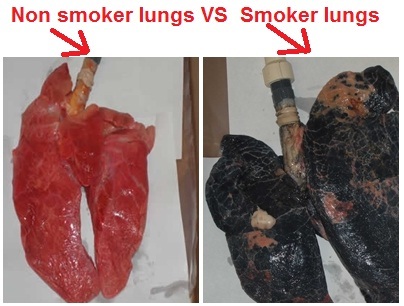 The thing is, lungs age with or without smoke inhalation (just way faster with). Progressive failure of pulmonary function is labeled COPD, essentially the end stage of normal aging decline in the lungs. This is strongly accelerated by smoking. And, of course, death from lung cancer is the most common form of cancer death in the US. It is less common overall than prostate cancer in men and breast cancer in women, but more deadly than either. Sarcopenia occurs when skeletal muscles shrink during aging. Reduced signalling from pro-anabolic hormones such as testosterone contributes, as does impairment of stem cells involved in skeletal muscle repair known as satellite cells ^. Sarcopenia is one of the most visible symptoms of aging. Though to some extent accepted as natural, muscle wasting is a huge contributor to frailty and reduced quality of life ^. Neurons: Post mitotic (never dividing) cells which transmit information. Astrocytes: Helper cells which do the metabolic work for the highly delicate neurons. Microglia: Macrophage-like cells which remove waste and mediate inflammatory responses. Myelin cells: Oligodendrocytes and schwann cells which insulate axons like rubber on a wire. The first three cell types have all been implicated in the complex pathology of neurodegeneration. Neurodegenerative diseases include Alzheimer’s, Parkinson’s, ALS (Lou Gehrig’s disease), Huntington’s, and FTD. While they each affect different parts of the brain and thus have different neurological symptoms, they all include a mix of astrocyte dysfunction, insoluble protein accumulation, microglial inflammatory responses, and progressive neuronal death^^. They occur with various frequencies, with Alzheimer’s being almost the default given enough aging in the brain and Huntington’s being a more specific genetic disorder. Most importantly, they are all the worst things in the world. They also all have nothing but (weakly) palliative treatment. I’m not sure if the FDA is just extra concerned with side effects of potential treatments or what, but if I had Alzheimer’s and the one drug that can cure it had a 50% chance of resulting in the baby alien from the movie Alien exploding out of my skull I would still not think twice before taking it. One recent study, however, known as the MEND trial, saw positive results with Alzheimer’s after adjusting many nutritional parameters and correcting nutritional deficiencies/ adding anti aging supplements. It’s important to realize that in the end, neurodegenerative disorders are the end stage of aging in the brain. Genetically normal young people do not get Alzheimer’s, and likewise each and every elderly person has at least some of the pre-clinical symptoms (amyloid accumulation in particular)^. Basic changes which everyone knows about include tooth decay/gum disease and increased constipation^. However, another common and particularly insidious issue is inflammation in the intestines resulting in reduced nutrient uptake (which will exacerbate symptoms across the body)^. Cancers of the stomach and colon also grow increasingly common with age. Liver damage with aging is also a serious issue. Fat accumulation in the liver along with inflammation from a number of factors (hepatotoxic drugs, hepatitis C exposure, alcohol intake, etc) can lead to scar tissue eventually replacing the normally highly regenerative liver tissue^. The young liver can do most of it’s metabolic work at 20% efficiency, but liver failure is still a common cause of death in the elderly^. Particularly infamous in the urinary system is the prostate, an organ which represents the most common cause of cancer in men. I say the organ is the cause, given that studies have that 50% of men age 70 to 80 have malignincies present according to autopsy studies^. If cancer doesn’t occur, benign prostatic hypertrophy can make it hard to pee^. The kidneys are strongly effected by aging as well, with kidney function declining significantly^. Crosslinking of kidney tissue is a problem because it prevents proper removal of waste across barriers to be excreted. This is a particular problem in diabetics^. For those for whom the kidney represents the Achilles heel of their aging physiology, dialysis in the only option until end stage renal disease eventually defeats them. The most well known aspect of endocrine aging, however, is the increase in insulin resistance and the rise of Type 2 diabetes. This is one of the most readily modulateable symptoms of aging, but for those who do not actively take precautions diabetes is essentially a form of accelerated aging in and of itself. Diabetes will strongly increase risk for heart failure, atherosclerosis, dementia, kidney disease, neuropathy, blindness, and probably other things not explicitly listed as well^. In part 2 of this article this will make more sense, as insulin and insulin-like peptide signalling and sugar associated crosslinks are both fundamental to the aging process. The aging of the cardiovascular system is notorious for causing the largest percentage of deaths in modern society, directly via heart attacks, strokes, and progressive heart failure, as well as indirectly in dementia^. The most common issues underlying cardiovascular risk are atherosclerosis and high blood pressure (which also contribute to each other). This is the classic “hardening of the arteries” syndrome, where cholesterol occludes blood flow and prevents proper elasticity of the vessel wall while increasing blood pressure^. Luckily, cardiovascular disease risk can be mitigated by many life style factors, and those who eat particularly healthy and exercise while avoiding smoking have a leg up^. On the other hand, one form of heart disease particularly common to the oldest of old involves accumulation of the transtherytin amyloid protein in the heart which causes dysfunction and death as it accumulates. This is the pathology behind “senior systemic amylodosis“, how most of the genetic lottery winners who have survived everything else end up dying^. Female reproductive capacity famously jumps off of a cliff during menopause, but male reproductive capacity also is reduced with aging^. Genetic alterations in gametes contributes to an increased risk of birth defects in older parents^. Though each system appears to fall apart in its own manner, specific underlying cellular causes appear to be similar in each case. Broadly, cells begin to lose energy, signal within and without less effectively, accumulate waste and stimulate inflammation^. The fact that many treatments like calorie restriction and exercise have so many benefits across tissues is a testament to the common nature of the menace. Now, we will look into that deeper nature a bit more closely. 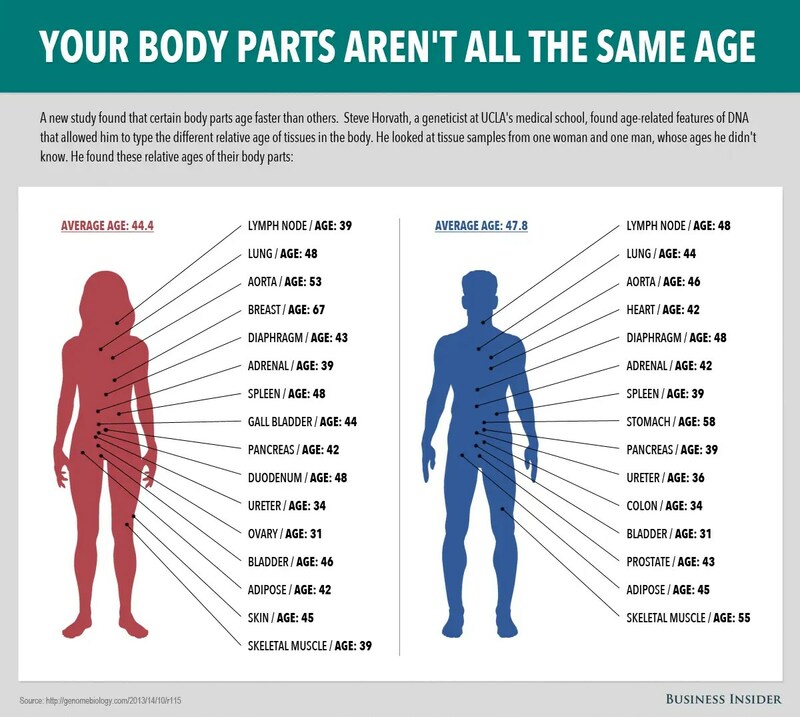 In 2013 Steve Horvath proved, via analyzing complex patterns of DNA methylation in a man and woman and comparing them to an array of people of different ages, that tissues actually age at different rates. This is mainly just interesting as well as a potential biomarker of aging damage, but highlights the fact that there are fundamental similarities in all aged cells at the level of individual genes effected. The hematopoetic stem cells that create your blood become senescent in largely the same was the stem cells in your brain do, though one situation causes immunosenescence and one forgetfulness. Diet and exercise have similar effect at improving health in muscle tissue, brain cells and heart tissue. What’s behind all of this? It’s simple. Calorie Restriction, in green, which activates AMPK and deactivates mTOR. MToR complex 1 is the closest thing to a master regulator of metabolism that a cell has. When turned on, protein synthesis is stimulated and anabolic activity is promoted. When it is deactivated, cell growth is slowed or halted and repairing activities like autophagy are promoted. MToRC1 is also an essential molecule for cancer growth and its inhibition has been associated with reduced cancer incidence and severity ^. Its inhibition results in increased lifespan^. AMPK is stimulated by exercise and the anti insulin resistance drug metformin, and has the effect of enhancing transcription of sirt1, enhancing autophagy, improving insulin sensitivity and reducing cell proliferation^. Insulin Signaling, in blue, driven by both Insulin as well as the the ultimate pro aging molecule IGF-1 mentioned in part 1, which was mutated in Cynthia Kenyon’s original long lived worms and Andrzej Bartke’s long lived Methuselah mice. It also represents a large part of why type 2 diabetes is accelerated aging. High insulin signalling levels promote cell division and inhibit repair mechanisms, being associated with both aging and cancer^^. FOXO3, a transcription factor, is among the most important downstream targets and is required for the extended lifespan of insulin mutant worms^. Klotho is an important modulator of FOXO3 and works against aging^. Inflammation: Inflammation signaling is generally damaging and increases across tissues with age. Inflammation reducers like curcumin (turmeric) and aspirin are suspected to have beneficial effects on age-related disease^. The exact mechanisms that inflammation acts through are not full understood, but the transcription factor NF-kappa-beta along with its downstream targets such as TNF-alpha, IL-1beta, Interferon gamma, and IL6 are suspected of having a role^. Oxidative Stress/ Mitochondrial Signalling: Oxidative stress, once thought to be the main driver of aging damage, is now suspected of being necessary for a protective hormetic response^. However, an exception may exist in the mitochondria, whereas mitochondria-target antioxidants have shown to slightly extend lifespan^. Telomere and Genome Maintenance: Many of the nuclear enzymes involved in genome maintenance listed above repair DNA, and mutations can cause both premature aging and cancer. Telomeres: Mentioned in part 1 of this series, telomeres are established, essential components of chromosomes which become damaged with aging through stress and multiple rounds of cell division^. Mice engineered to replace their telomeres have extended lifespan^, and the (1 woman) company Bioviva is trying to take a similar route in humans. Werner’s syndrome, where patients tend to show old age phenotypes in their 40’s and usually die of cancer, is caused by a mutation in WRN, a gene needed for effective DNA repair. Huchinson-Gilford Progeria Syndrome patients like Sam Berns, the most striking early agers, have a mutation in LMNA and die by 20 of atherosclerosis (this protein is also increased in abundance in the cells of normal old people^). This protein is important for nuclear structure and chromosome arrangement. Retrotransposons, self replicating aspects of our own DNA, have been seen to increase activity and number with age and cause damage^^. Repressive epigenetic signatures such as H3K9, meant in large part to protect our genome from damage and aberrant expression, are reduced with aging^. SIRT6, a protein associated with promoting DNA repair and telomere maintenance as well as reducing inflammation, extends the lifespan of mice by ~15% and causes a premature aging effects when mutated^. This list is by no means exhaustive, but represents some of the most thoroughly studied pathways. Molecular biologists are good at dissecting and deciphering genetic pathways, so we have the tools to dissect aging from this angle well developed. Many druggable targets arise, quite a few of which can be targeted through lifestyle factors, food or supplements. Many long existing approaches to avoiding age-related disease rely on these pathways. Many of these pathways are tied with cancer and thus we could be winning multiple battles at once. Insights are beginning to arise at how all these factors tie together, helping exceptional scientists discover what the most fundamental causes of aging may be, and how we can treat these. 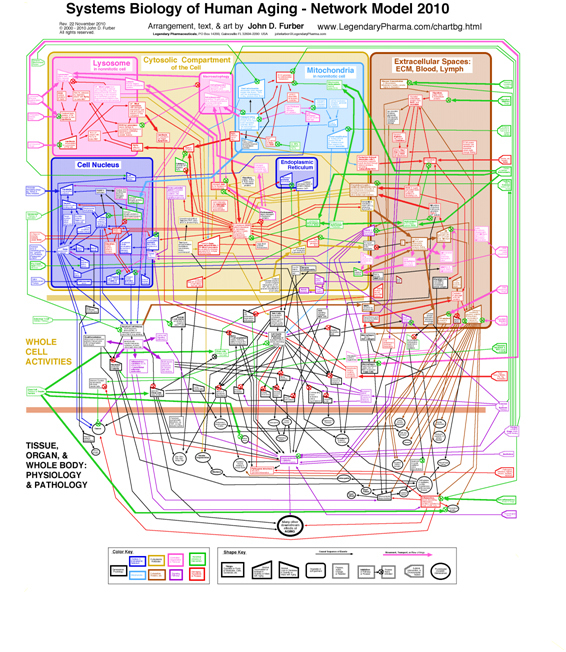 Dissecting genetic pathways can lead to obsession with anomalous details and useless systems biology information dumps, capable of getting NIH funding but not improving anybodies life. Pathway biology does not effectively address some anomalous and case specific effects, such as thymic involution and T cell senescence, menopause, and how to treat hormonal deficiencies. You can attempt to drug the hell out of everything studied for aging related effects, but some things may simply not be drug-able (reversing seemingly permanent damage in particular). SENS, an organization started by Aubrey De Grey to target aging damage at a molecular level, follows the following 7-step model of aging damage. This represents one of the first and only attempts to holistically compile a list of age related molecular alterations. Glycosens– The accumulation of tissue stiffening cross links occurs in all tissues over time. These are largely created from what are called glycation reactions, non-enzymatic reactions driven by glucose and other sugars. Glucosepane is a particular common type of crosslink which represents over 90% of total crosslinks in the body^. These crosslinks are not naturally reversible, and their buildup stiffens tissue and reduces function. Amylosens– Amyloid proteins are normally soluble, but can become folded in a way which causes them to stick together and form fibrils. They can accumulate in extracellular space and cause damage when not removed or degraded. The most famous amyloid is certainly amyloid beta-42, which accumulates in the brain of alzheimers patients and causes damage, but other amyloids such as transtherytin amyloid also cause significant damage in aging. Lysosens– Lysosomes are the organelle most responsible for eliminating garbage in our cells. They become clogged with a mess of undegradeable compounds known collectively as lipofuscin due to a combination of signalling changes, increased loads of damaged proteins, and internal dysfunction^. When this occurs, the function of the entire cell is impaired due to reduced quality control. A similar situation occurs with proteasomes, smaller cellular structures which degrade individual proteins^. Mitosens– Mitochondria are damaged everyday in our cells, but they generally are degraded in the lysosome when they become truly dysfunctional in a process known as mitophagy. However, impairment of mitophagy as well as accumulating damage in mitochondrial DNA itself results in sick mitochondria with reduced function during age^. Apoptosens– Cells which are damaged with aging often acquire what is known as a senescent phenotype, where they are functionally impaired and unable to divide. Senescent cells may also release inflammatory factors and damage surrounding tissue, rather than just taking up space^. Replenisens– Representative of the general need to replace lost cells, replenisens is broad and alludes to all the stem cell work currently being done in labs across the world. Among the most well known and important cells lost to aging are stem cell populations such as hematopoetic stem cells in bone marrow or satellite cells in muscle. Certain age related diseases such as Parkinson’s result entirely from a loss of a single population of cells. Both dividing cells and non dividing cell populations may die with aging, and both must in principal be replaced at a certain point to prevent dysfunction. Oncosens– Broadly, cancer occurs with aging as a result of multiple factors including a weak immune system, inflammation, pro-oncogenic genetic and epigenetic changes in individual cells, and dysregulation of metabolism^. Generally, it’s better to target cancer before it arises than to fight a painful battle against an evolving tumor. 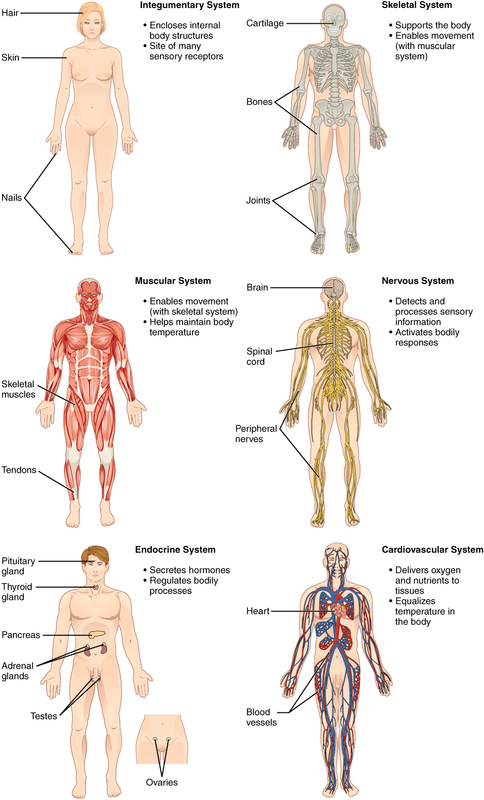 Genetic issues: We listed multiple forms of genetic damage earlier when discussing the molecular biology of aging. Pathway biology approaches have begun to trace back to fundamental genetic and epigenetic causes^, which are forms of damage on their own, and in some ways genetic damage could potentially represent a bridge for the gap between philosophies. SENS has not focused on damage at the level of DNA. Blunt force approach. Address the issue directly, don’t waste money glossing the details. Potentially extend lifespan much farther through reversing otherwise irreversible symptoms rather than simply slowing their progression. In the end, this is the only way to radical life extension, as current evidence suggests that the crux of aging pathway biology is largely to reduce damage in the first place^. Many will be one-time or periodic treatments rather than daily supplements, and thus could potentially be less of a hassle and even cheaper^. A cool guy with a beard told you so^. The technology required to address issues at a damage level, like gene therapy and stem cell treatments, are rapidly becoming feasible but face more technical and regulatory hurdles. We can currently only estimate how many sources of damage in need of targeting exist, as well as their relative importance. As the molecular biology of aging is itself largely a process of damage mitigation, at least on some fronts, it is evident that damage based theories must be addressed for radical life extension. Thus, while those looking to extend healthspan tend to be content with the pathway biology, life-extensionists and immortalists are discontent sans a damage based, sledgehammer approach. In the end, however, it is likely in anyone particularly interested in life-extension’s best interest to eschew both approaches. Even if radical rejuvenation technologies are the end goal to cure damage, living an extra healthy lifestyle with proven long life compounds thrown in will cut damage occurring in the first place. It will cut the risk of early death down significantly, and may extend your personal maximum theoretical lifespan a bit. As long as it doesn’t stress you out or bankrupt you, it will likely increase your chance of reaching the age of robust rejuvenation therapies and help you achieve Longevity Escape Velocity. This awesome review: Riera CE, Merkwirth C, João Pedro de Magalhães, “Dillin A, “Signalling Networks Determining Lifespan”, Annual Reviews of Biochemistry, Jun 2016.
http://www.sciencedirect.com/science/article/pii/S0955067417300017 : Thomas Rando, Anne Brunet, “Interaction Between Epigenetics and Decline in Aging Stem Cells”, Current Opinions in Cell Biology April 2017.
http://www.senescence.info/: João Pedro de Magalhães, a senior lecturer of aging at Liverpool who did his postdoc with the legendary George Church, made this site to catalog essentially all information available into one database. Includes info on long lived animals (a topic for another time on this site), human longevity genes, gerontology organizations and companies, leaders and entrepreneurs in the field, molecular aging studies, and more. http://www.longecity.org/forum: The number one site for the life extension community, with a highly active forum and a range of viewpoints/backgrounds. www.fightaging.org: Continuous updates on new discoveries in aging research. http://www.anti-agingfirewalls.com/: A blog dedicated to examining the most detailed intricacies of aging biology and how they fit together. Requires a biology background.